Beadsmith Wire Snowflake Ornament Form 9.00"
Additional Information: Instructions for basic snowflake design: 1. Add your beads to the wire form, leaving 1/2"" of empty wire at the end 2. Use round nose pliers to create a loop at the wire end by turning the end of the wire towards the last bead. Repeat steps 1 and 2, until all the spokes are filled. 3. 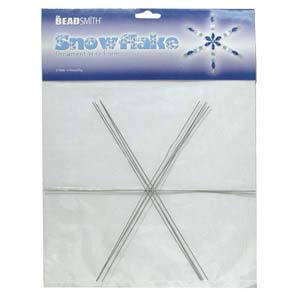 Thread a ribbon or string through one of the end loops of your snowflake. Another great product that works well. Received quickly. Packaging was good.